"Okeh" redirects here. For the expression, see Okay. Since 1926, Okeh has been a subsidiary of Columbia Records, now itself a subsidiary of Sony Music. Today, Okeh is an imprint of Sony Masterworks, a specialty label of Columbia. Okeh was founded by Otto K. E. Heinemann, a German-American manager for the U.S. branch of Odeon Records, which was owned by Carl Lindstrom. In 1916, Heinemann incorporated the Otto Heinemann Phonograph Corporation, set up a recording studio and pressing plant in New York City, and started the label in 1918. The first discs were vertical cut, but later the more common lateral-cut method was used. The label's parent company was renamed the General Phonograph Corporation, and the name on its record labels was changed to OKeh. The common 10-inch discs retailed for 75 cents each, the 12-inch discs for $1.25. The company's musical director was Fred Hager, who was also credited under the pseudonym Milo Rega (his middle name and his surname reversed). Okeh issued popular songs, dance numbers, and vaudeville skits similar to other labels, but Heinemann also wanted to provide music for audiences neglected by the larger record companies. Okeh produced lines of recordings in German, Czech, Polish, Swedish, and Yiddish for immigrant communities in the United States. Some were pressed from masters leased from European labels, while others were recorded by Okeh in New York. Okeh's early releases included music by the New Orleans Jazz Band. In 1920, Perry Bradford encouraged Fred Hager, the director of artists and repertoire (A&R), to record blues singer Mamie Smith. The records were popular, and the label issued a series of race records directed by Clarence Williams in New York City and Richard M. Jones in Chicago. From 1921–1932, this series included music by Williams, Lonnie Johnson, King Oliver, and Louis Armstrong. Also recording for the label were Bix Beiderbecke, Bennie Moten, Frankie Trumbauer, and Eddie Lang. As part of the Carl Lindström Company, Okeh's recordings were distributed by other labels owned by Lindstrom, including Parlophone in the UK. 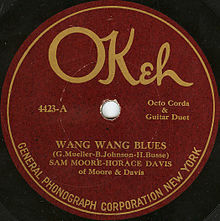 In 1926, Okeh was sold to Columbia Records. Ownership changed to the American Record Corporation (ARC) in 1934, and the race records series from the 1920s ended. CBS bought the company in 1938. OkeH was a label for rhythm and blues during the 1950s, but jazz albums continued to be released, as in the work of Wild Bill Davis and Red Saunders. General Phonograph Corporation used Mamie Smith's popular song "Crazy Blues" to cultivate a new market. Portraits of Smith and lists of her records were printed in advertisements in newspapers such as the Chicago Defender, the Atlanta Independent, New York Colored News, and others popular with African-Americans (though Smith's records were part of Okeh's regular 4000 series). 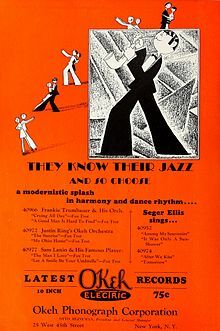 Okeh had further prominence in the demographic, as African-American musicians Sara Martin, Eva Taylor, Shelton Brooks, Esther Bigeou, and Handy's Orchestra recorded for the label. Okeh issued the 8000 series for race records. The success of this series led Okeh to start recording music where it was being performed, known as remote recording or location recording. Starting in 1923, Okeh sent mobile recording equipment to tour the country and record performers not heard in New York or Chicago. Regular trips were made once or twice a year to New Orleans, Atlanta, San Antonio, St. Louis, Kansas City, and Detroit. 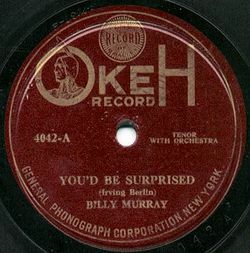 Okeh releases grew infrequent after 1932, although the label continued into 1935. In 1940, after Columbia lost the rights to the Vocalion name by dropping the Brunswick label, the Okeh name was revived to replace it. The script logo design still in use today was introduced on a demonstration record announcing that event. The label was again discontinued in 1946 and revived yet again in 1951. In 1953, Okeh became an exclusive R&B label when its parent Columbia Records transferred Okeh's pop music artists to the newly formed Epic Records. In 1963, Carl Davis became Okeh's A&R manager and boosted Okeh's fortunes for a couple of years. Epic Records took over management of Okeh in 1965. Among the artists during Okeh's pop phase of the 50s and 60s were Johnnie Ray and Little Joe & the Thrillers. With soul music becoming popular in the 1960s, Okeh signed Major Lance, who gave the label two big successes with "The Monkey Time" and "Um, Um, Um, Um, Um, Um". Fifties rocker Larry Williams found a musical home for a period of time in the 60s, recording and producing funky soul with a band that included Johnny "Guitar" Watson. He was paired with Little Richard, who had been persuaded to return to secular music. He produced two Little Richard albums for Okeh Records in 1966 and 1967, which returned Little Richard to the Billboard album chart for the first time in ten years and produced the hit single "Poor Dog". He also acted as the music director for Little Richard's live performances at the Okeh Club in Los Angeles. Bookings for Little Richard during this period skyrocketed. Williams also recorded and released material of his own and with Watson, with some moderate chart success. This period may have garnered few hits but produced some of Williams's best and most original work. Much of the success of Okeh in the 1960s was dependent on producer Carl Davis and songwriter Curtis Mayfield. After they left the label (due to disputes with Epic/Okeh head Len Levy), Okeh gradually slipped in sales and was quietly retired by Columbia in 1970. In 1993, Sony Music reactivated the Okeh label (under distribution by Epic Records) as a new-age blues label. Okeh's first new signings included G. Love & Special Sauce, Keb' Mo, Popa Chubby, and Little Axe. Throughout the first year, in celebration of the relaunch, singles for G. Love, Popa Chubby and Keb' Mo were released on 10-inch vinyl. By 2000, the Okeh label was again retired, and G. Love & Special Sauce was moved to Epic. It was re-launched in 2013 as a jazz line under Sony Masterworks. In January 2013, Sony Music reactivated the Okeh label as Sony's primary jazz imprint under Sony Masterworks. The imprint is part of Sony Masterworks in the U.S., Sony Classical's domestic branch, focusing on both new and established artists who embody "global expressions in jazz". The new artists include David Sanborn, Bob James, Bill Frisell, Regina Carter, and Dhafer Youssef. Sony Music Entertainment owns the global rights to the Okeh Records catalogue through Epic Records and Sony's Legacy Recordings reissue subsidiary. Parlophone parent EMI's rights to the Okeh catalogue in the UK expired in 1968 at which point Sony Music's predecessor company CBS Records took over distribution. The OKeh Laughing Record, which featured a man and woman laughing uncontrollably, was featured extensively in the Walter Lantz Productions cartoon short Sh-h-h-h-h-h, the last short directed by Tex Avery. The record was recorded in Germany by Beka Records in 1923, and would be issued in the UK as The Parlophone Laughing Record. Jean Shepherd also used the record many times as background music on his radio show on WOR. ^ Jackson, L. A. (2010). Musicology 2101: A Quick Start Guide to Music Biz History. MKM Publishing. pp. 114–. ISBN 978-1-4507-0166-2. Retrieved 2014-08-09. ^ Hoffman, Frank (2004-08-21). Encyclopedia of Recorded Sound. Taylor & Francis. pp. 765–. ISBN 978-0-203-48427-2. Retrieved 2014-08-09. ^ Smith, Caspar Llewellyn (2011-06-15). "Okeh Records releases the first blues record". The Guardian. ISSN 0261-3077. Retrieved 2018-01-08. ^ a b c Rye, Howard (2002). Kernfeld, Barry (ed.). The New Grove Dictionary of Jazz. 3 (2nd ed.). New York: Grove's Dictionaries Inc. pp. 186–187. ISBN 1-56159-284-6. ^ Laird, Ross; Rust, Brian (2004). Discography of OKeh Records, 1918-1934. Greenwood Publishing Group. pp. 11–. ISBN 978-0-313-31142-0. Retrieved 2014-08-09. ^ Laird, Ross; Brian Rust (2004-07-30). Discography or OKeh Records, 1918–1934. Westport, Connecticut: Praeger Publishing. ISBN 978-0-313-31142-0. ^ Tsotsi, Tom (1988). "Gennett-Champion Blues". 78 Quarterly. 1 (3): 31. Retrieved 24 December 2018. ^ Zolten, Jerry (February 6, 2003). Great God A'Mighty! The Dixie Hummingbirds: Celebrating the Rise of Soul Gospel Music. Oxford University Press. pp. 194–. ISBN 978-0-19-534845-3. Retrieved 2014-08-09. ^ Inc, Nielsen Business Media (6 November 1954). "Billboard". Nielsen Business Media, Inc. – via Google Books. ^ "Okeh Names Carl Davis". Google Books. Billboard. 13 April 1963. Retrieved 11 March 2013. ^ a b White (2003), p. 268. ^ Williams, Richard (19 August 2012). "Carl Davis obituary". the Guardian. ^ a b Publishing, Rames El Desouki, The Traveller. "CVINYL.COM - Label Variations: Okeh Records". www.cvinyl.com. Retrieved 2018-01-08. ^ Staff (11 January 2013). "Sony Classical Relaunching OKeh Records Jazz Imprint". Billboard. Retrieved 11 September 2016. ^ Billboard - Google Books. Books.google.com. 1968-05-11. Retrieved 2013-03-11. ^ "Okeh Laughing Record : Okeh : Free Download & Streaming : Internet Archive". Archive.org. Retrieved 2013-03-11. Wikimedia Commons has media related to Okeh Records.